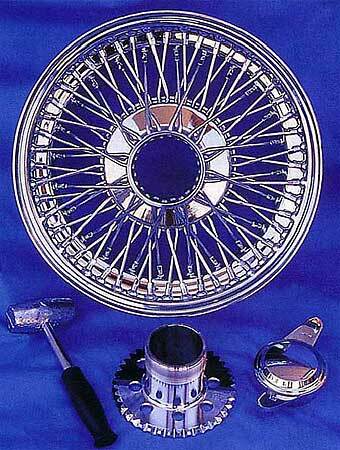 Dayton Wheels: Wire Wheels that can take the Torque! Many of us have extended the limits of our beloved MGB's (and 'Cs and Midgets). It's the horsepower, you see. And some of us have gone the extra mile to build serious V8-powered 'Bs with plenty of torque (confirming that old adage that 'too much is just right'). Dunlop wire wheels with Rudge knock-on splined hubs are synonymous with classic British sports cars. There just isn't anything as beautiful as the sparkle of shiny spokes and spinners at speed. That's why it's disappointing that our high-powered MG's can't use knock-on wire wheels. The conversion gurus all advise against it - the weak spokes and ultra-thin splines on the hubs will fail, they say. Maybe the experts don't recommend wire wheels because they haven't seen some excellent examples made across the pond in the US by Dayton Wheel Concepts. "We built wheels for some pretty powerful cars in the 1930s, such as Packards and Duesenbergs," says Mike Edgerton of Dayton, 'and we've replaced Dunlop wheels on a number of original AC Cobras, so wheels for an MGB V8 are no problem." According to Edgerton, Dayton began supplying wire wheels to the car industry in 1916. Winning cars al the Indy 500 rode on Dayton wire wheels throughout the 1930s, until the advent of magnesium wheels. High performance sports racing cars, such as the Corvette powered Echidnas, also used Dayton wire wheels successfully in the 1960s. The company offers knock-on wheels in a variety of rim widths and diameters and can provide them with between 72 and 180 spokes in radial, cross and triple-cross Iacing, arranged in bead, well or reverse offsets. These wheels are sealed for tubeless operation - no need for those pesky (and expensive) inner tubes. Chrome wheels also feature swaged stainless-steel spokes and all wheels are fully tested and come ready to mount (no need to readjust or true the spokes). So, logic suggests that, if a Cobra can't break a Dayton spoke or spin a drive hub, then a V8 MGB-or any high output 'B, 'C or even Midget - should be able to use them. 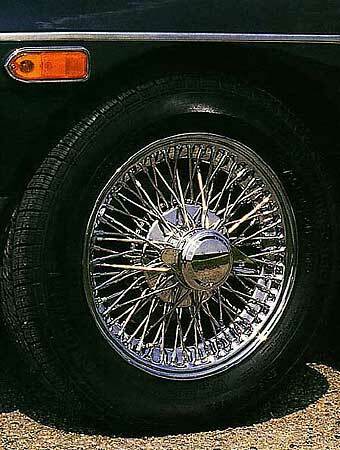 Of course, high-performance sports cars such as the Jaguar E Type used Dunlop wire wheels with Rudge spline-drive hubs. But our MGBs are pushing 30 years or more, and their splined hubs are worn too much to handle the extra torque, even with brand-new wheels. 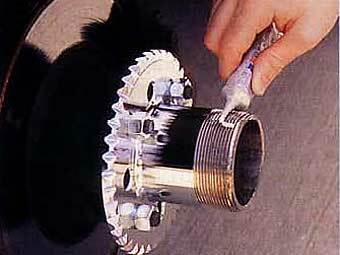 We could install new hubs, but even V8 conversion expert Roger Williams advises against it. A precision-machined drive hub simply bolts on in place of the normal wheel, and a knock-on nut keeps the wheel firmly attached, just like the old Rudge system. In fact, Dayton has a two-eared knock-on spinner that's the spitting image of what originally came on wire-wheeled MGBs, so the resulting conversion is very convincing, as well. What's more, the cost of a set of Dayton wheels (in the US) is only slightly more than purchasing a new set of reproduction MGC (15x5-inch) wire wheels with new splined hubs. A good companion to these wire wheels is Continental's ContiSport tire. Because MGB's have limited space for wider tires, it's difficult to find a high-performance tire in the somewhat narrow (by today's standards) size that will fit a 'B. Continental's CH95 Touring Contact 185/65R15 tire has the correct dimensions - the same as a 185 70R14 - that will fit. And the tire is 'H' speed rated, as well (similar in performance to the Touring Contact tire used on the Jaguar X-type), good for up to 130 mph and able to handle the performance of a hot V8. Other sizes are available for those willing to push tire size to the limit. 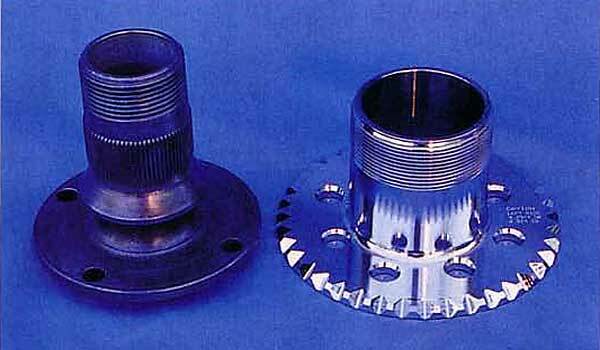 Compare the Dayton drive teeth (right in picture, above) with the original "Rudge" type hub splines. The Dayton hubs can cope with much more power than the Rudge items. The massive teeth on the wheel's machined hub (below) mesh with those of the drive hub to provide an extremely positive and durable drive system that can handle V8 power. Begin the conversion by installing the drive hubs using 'standard' automotive lug nuts (the Rostyle-type are too tall and prevent the wheel from sitting properly on the hub). These will accurately centre the hubs. Torque to 75 ft-lbs (98 Nm). Next, apply a thin coat of grease to the hub adaptor threads and to the beveled edge of the knock-on nut. In the old days, you had to install tires on wire wheels by hand. But, with today's modem equipment, tires can be installed without damage to the spokes or rims. Your installer must use a European-style tire changer - with no center post. Note the thick silicone sealant (black) on the rim that permits tubeless operation. 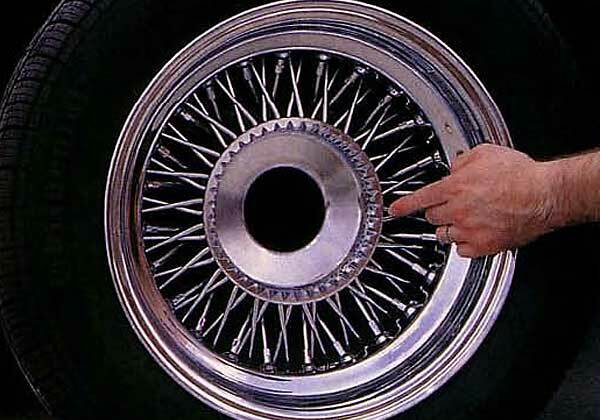 The Dayton wheel will only work with bolt-on hubs (which most MG's came with in the 1970s), and the conversion to knock-on wire wheels is extremely simple. In fact, it's just like changing a tire-the entire process takes only about an hour. As the Contact Touring 185/65 R15 tire fits 5J through 6J rim widths, we opted for the five-inch version to preclude any chassis or body interference. After raising the car and securing it firmly on axle stands, remove the existing road wheels which, in our case, were Minilite replicas. The Dayton wheel package includes four wheels, drive hubs, knock-on nuts - and even a very smart lead-faced hammer. 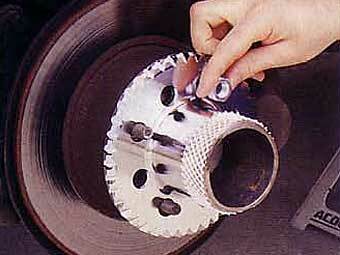 Finish the job by installing and tightening the knock-on spinner. The lead-faced hammer minimizes damage to the chromed nut. Once the tires are fitted, simply slip the new wheel over the drive hub... Now repeat three more times before dropping the car off the jacks and standing back to admire your handiwork. Don't you agree that the new wire wheels bring back that classic MGB look? Special Thanks to CH Publishing for granting permission for The British V8 Newsletter to reprint this article. Disclaimer: This page was researched and written by Robb Northrup. Views expressed are those of the author, and are provided without warrantee or guarantee. Apply at your own risk.